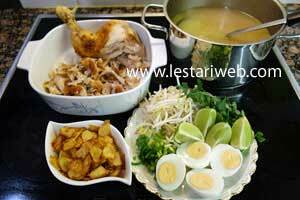 Here it is the famous variant of spiced chicken soups from Madura Island or popular in Indonesia as "Soto Ayam Madura". Madurese, one among hundreds of Indonesian ethnic people, are well known as nomads & hard working people. Due to their struggle to gain a better job and life whatever they do, included in culinary sector, seem their perseverance is paid off. 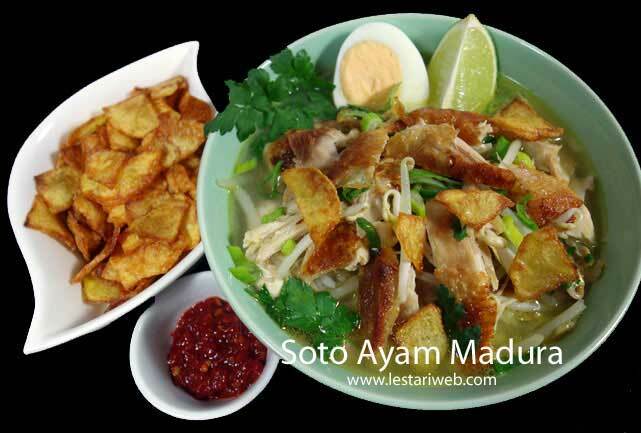 Today you can find Soto Ayam Madura easily almost in big cities of Indonesia such as Jakarta, Bandung or Surabaya. You can find this dish from street food hawker to top-end restaurants. 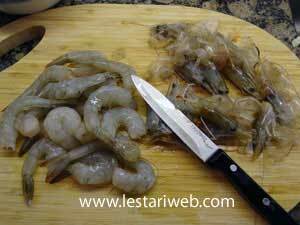 Peel off the shrimp's sheels, rinse in cols water and blend until smooth. 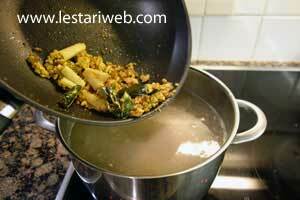 Mix with approx.100 ml/4 fl.0z of cold water, squeeze it with your hand so that the broth comes out. Strain with kitchen sieve. 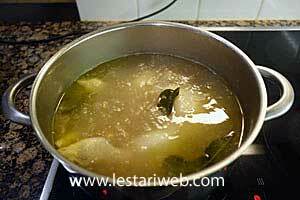 Pour in 2.5 liter water in a deep saucepan, add the shrimp's broth. Attention: Add while the water still cold, otherwise the shrimp's broth will turn out like granule when you add it in hot/boiled water. Bring to boil. 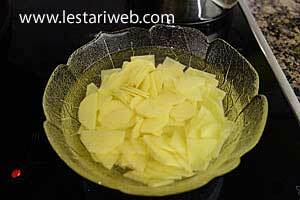 Prepare all ingredients for the paste, cut or into smaller pieces if necessary, specialy for candlenuts. Ground the pepper with mortar until smooth. 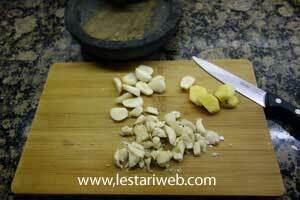 Put all ingredients for the spice paste in grinding stone or food processor & grind/blend until smooth. 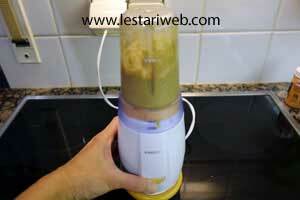 (If necessery add a little bit oil in the food processor to help the blending process). 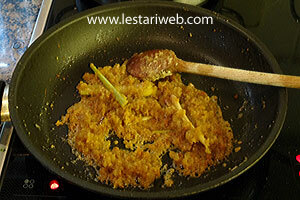 Add the paste, lemon grass & kaffir-lime leaves. 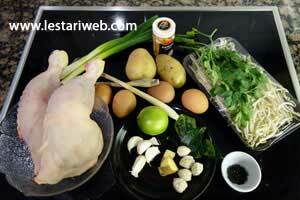 Add the lime juice & chicken broth powder. 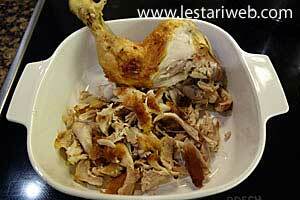 Bring over medium heat to boil, then cook for about 30 minutes until the chicken is tender. Stir occasionally. Adjust the seasoning, add salt & sugar to taste. Kept the soup pipping hot. Meanwhile, peel off potatoes, quartered and slice thinly. 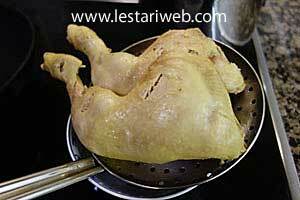 Soak into cold water, add some salt and a bit backing soda (if available) to make it crispy. Set aside to drain. When the chickens are tender enaugh, take them out from the pan, set aside to drain. 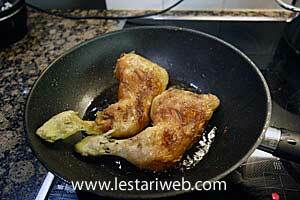 Deep-fry the chicken in used oil before until golden brown. Set aside to drain or pat dry with kitchen paper. Shred or slice thinly. Serving Method: Put the glass noodle (or rice if used), sliced chicken in a individual serving bowl. Garnish with spring onion, bean sprout & egg then ladle with the hot soup. 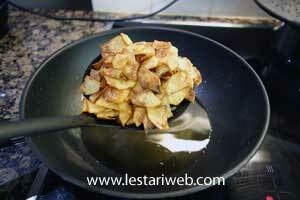 Sprinkle with parsley & fried potatoe chips. 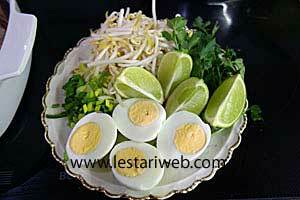 Serve with lime juice, kecap manis and sambal rawit if you like it spicy..